Which needle system is used is generally dictated by the make & model of sewing machine and the sewing job in question. 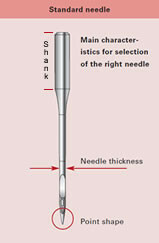 Within this needle system, there are variants that a user can choose from to meet specific requirements. • Which point shape? Standard round point, ball point or leather points are examples. Not all needles available are listed here, email the details from your old needle packet with your make and model of sewing machine to parts@hobkirk.co.uk and we will reply as soon as possible. Failure to use the correct 'needle system' and 'size' will result in damage to the sewing machine; seek advice if you are unsure, Hobkirk Sewing Machines will not be liable if you purchase the wrong needles. Industrial sewing machines are set-up by sewing machine mechanics to use one size of needle for a specific job, so changing to a smaller size without having your machine 'retimed' could result in skipping stitches, using a larger size your needle will hit the 'hook & base' damaging it, and causing the thread to break. If you find your machine is breaking needles often then your machine may need to be 'retimed' and/or a more suitable needle for the task at hand. Email parts@hobkirk.co.uk for more information on sewing machine needles or about having your sewing machine retimed/­repaired by one of our mechanics. Groz Beckert UY128GAS-SES ballpoint industrial coverseam sewing machine needle - available in sizes 70/10 up to 110/18. Pack quantities available in 10 or 100 needles. Groz Beckert 134-35R industrial sewing machine needle - Standard round point, available in sizes 90/14, 100/16, 110/18, 120/19, 130/21 and 140/22, in 1 x packet of 10 needles or 10 x packets of 10 needles. Groz Beckert 134-35D leather point industrial sewing machine needle - available in sizes 120/19, 130/21 and 140/22, in 1 x packet of 10 needles or 10 x packets of 10 needles. Groz Beckert industrial sewing machine needle - Medium Ballpoint, available in sizes 80/12, 90/14 and 100/16, in 1 x packet of 10 needles or 10 x packets of 10 needles. Groz Beckert industrial sewing machine needle - Ball point, available in sizes 80/12, 90/14, 100/16 and 110/18, in 1 x packet of 10 needles or 10 x packets of 10 needles. Groz Beckert 251 Blindstitch/­Blindhem machine needle, available in sizes 70/10, 80/12, 90/14 or 100/16, in 1 x packet of 10 needles or 10 x packets of 10 needles. Groz Beckert 251LG Blindstitch/­Blindhem machine needle, available in sizes 70/10, 80/12, 90/14 or 100/16, in 1 x packet of 10 needles or 10 x packets of 10 needles. Groz Beckert LWx6T Blindstitch/­Blindhem machine needle, available in sizes 70/10, 80/12, 90/14 or 100/16, in 1 x packet of 10 needles or 10 x packets of 10 needles. Curved overlock machine needle available in sizes 70/10, 80/12, 90/14, 100/16 and 110/18. Available in packs of 10 needles. Groz Beckert UY8454GAS-SES curved sewing machine needle, available in sizes 90/14 and 100/16. Available in packs of 10.